Dec. 14, 2018 – As the executive director of the Paper & Paperboard Packaging Environmental Council for the past 28 years, John Mullinder has heard his share of (mis)information about forestry and paper practices in Canada – namely, that the clearcutting used in the industry is the cause of widespread deforestation. “But Canada has one of the lowest deforestation rates in the world,” he notes. So what gives? With his new book, Deforestation in Canada and Other Fake News, Mullinder, a former journalist, uses facts to unpack several public misconceptions – from deforestation and reforestation, to “ancient forests,” to post-consumer and pre-consumer paper. Here, Mullinder shares some of his industry insights with Pulp & Paper Canada, a magazine also owned by CFI‘s parent company, Annex Business Media. PPC: The subject of “fake news” is certainly politically and culturally relevant in 2018. What had you been hearing about the industry that made you want to set the record straight? JM: There is definitely confusion about deforestation. It’s been years of frustration, running into people who know little about forestry and paper production, but plenty about killing and saving trees and deforestation. You meet somebody socially, and you tell them you work for the paper industry, and suddenly you’re talking about killing and saving trees. That was the main driver, because there’s so much misinformation out there. I wanted to get the facts out onto the table so that everybody could see them. Because I could see everybody firing past each other and using emotion and saying things that I didn’t believe to be true. It’s the one issue that’s bugged me for many, many years. I finally did something about it. I’ve been involved with the packaging side, and we hardly use any of the tree at all to make the paper packaging in Canada. Most of it is 100 per cent recycled content. Any bad stuff we get sent [from NGOs and the public] has to do with trees. So we’ve had to learn about the forestry side of it, even though we hardly use trees. That was part of my frustration – that we have a really good story to tell about paper packaging in particular, but it always comes back to how you are looking after the trees. So we have to know something about those trees and how they are looked after. PPC: You’ve been in the industry hearing these things since 1990. Was there anything that still surprised you as you researched the book? JM: There were about three or four things that surprised me. The images on the internet? The sheer overwhelming bulk of them when you Google images of “deforestation in Canada” are pictures of clear cuts everywhere [in the world]. It’s pervasive. The second surprise was the environmental groups, when I surveyed their websites and Facebook pages. None of them, not a single one, mentioned that Canada has one of the lowest deforestation rates in the world. I thought at least somebody would have referenced it, but there was absolutely nothing there. It may be there now – I haven’t checked recently. But when I did the survey that was a bit of a shocker. Another surprise is the seeming acceptance of the “ancient forest” argument. When you look at tree-age terms, only one per cent of the Boreal is over 200 years old. So what has all this talk about “ancient” actually been? It isn’t real. The fourth surprise would be how blatant some retailers are about their environmental claims. And how they don’t provide any backup. There’s something on page 72 about that. PPC: You talk in the book about some anti-paper messages that started spreading in the mid- to late 1990s – “save a tree,” etc. But as you point out, the electronic equivalents are wasteful in their own way. What do you think has allowed our thinking to be so pervasive? JM: Back in the early to mid-1980s, some environmental groups had legitimate concerns about some forestry and paper industry practices in Canada. That was a time of the War in the Woods and all that stuff. And it was part of a worldwide concern about natural resources being depleted. You had emotional images of clear cuts being used; you had blockades; you had people being arrested. It was constantly in the news cycle. Industry was painted in a bad light, and it was very much on the defensive. Once the linkage has been made and reinforced on an emotional level – like trees are being cut so you should save trees and use less paper – it’s very hard to turn that around. A good example today would be plastic and fish. I think the Canadian forest and paper industry has done a great job of turning that ship around, frankly. But there’s a long way to go. One of the problems is that our customers in the paper industry are not helping in some cases. Instead of fighting the misconceptions, some of them have jumped on the bandwagon and they’re touting how many trees they are saving by recycling. This just reinforces the stereotype that cutting trees is bad. We’re shooting ourselves in the foot to a certain extent. PPC: One of the stats that struck me was the fact that agriculture accounts for 36 per cent of Canada’s total deforestation rate while forestry sits at four per cent. What makes people zero in on logging as the face of deforestation? JM: I’m not a psychologist or a brain specialist, but I think it’s got a lot to do with how our brains interpret visual images. If you look at the front cover of the book, it’s a beautiful scene – gorgeous yellow canola flowers. You compare that to an ugly clear cut, and one is clearly good and the other is bad. That seems to be how our brain interprets it. And that’s the emotional connection that we get – when in actual fact, the canola field was deforested and the clear cut was reforested. PPC: Your book sets out to prove that Canada is actually a world leader when it comes to best harvesting practices. What can other countries learn from our model? JM: I know from talking to people from other countries that they do hold Canada in high esteem, but that’s really amongst the forestry people. The public, by and large, doesn’t even know this stuff. I would encourage other people to come to Canada to see how it works and learn from what we are doing here. PPC: We have your book. What are some other ways that the pulp and paper industry can help spread the word that Canada’s harvesting is sustainable? JM: Use the charts and information in the book, as well as blogs, articles and the media. Have a consistent message. Push sustainable forestry, not saving trees. Canada’s deforestation rate is one of the lowest in the world. We lead the world in certification of sustainably managed forests. And I hope the book shows that factual accuracy is really important. Seek facts out in context and check everything you’re told. I want people to enjoy the book. I want them to challenge anything I say in it. And to just spread the word, get it out there. 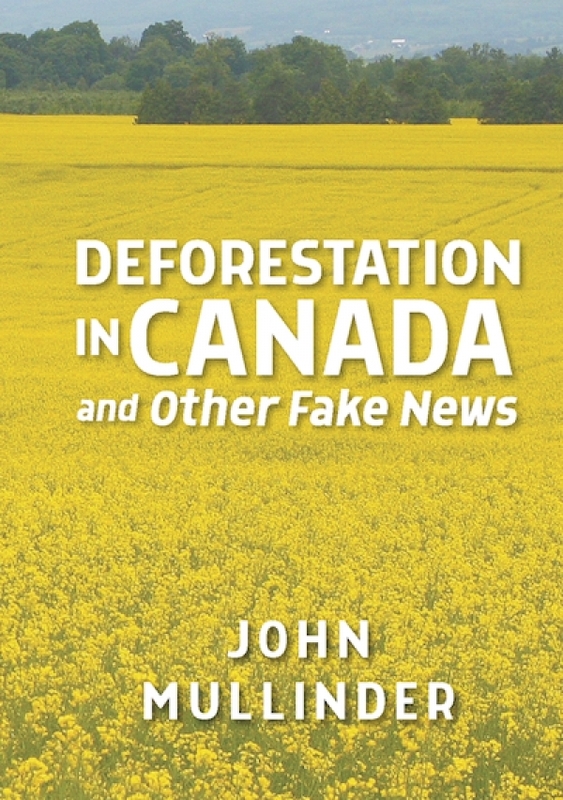 To order a copy of Deforestation in Canada and Other Fake News, visit johnmullinder.ca. This interview has been condensed and edited. It originally appeared on pulpandpapercanada.com.